"A family favorite - quick and easy." In a small bowl, mix together orange juice, parsley, salt, and chili powder. Heat oil until hot in a 12-inch skillet over medium-high heat. Cook chicken pieces until browned on all sides. Remove excess fat from skillet. 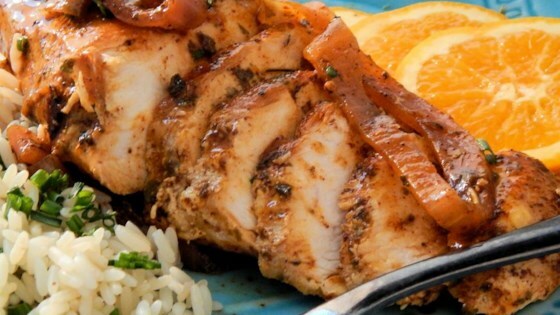 Add sliced onions and orange juice mixture to chicken in skillet. Heat to boiling, and then reduce heat to low. Cover. Simmer for 30 minutes, or until chicken is tender. Stir occasionally. This is a really good recipe. The only thing I added to it was 1 tbsp. of orange zest & fresh parsley for garnish. Everyone cleaned their plate with a smile! Very good result from this recipe. I would suggest adding a bit more chili powder as the sweetness of the orange juice almost over powers the spicy of the chili. This was tasty.. I think I would marinate this some of the sauce to infuse more flavor... good hot and cold!